Jim Gordon is insane and Gotham is alive with laughter. Far from being jovial, this laughter is tearing the city apart. It is no longer fun and games for The Joker as Batman tries to stop the virus that is wreaking havoc on Gotham. 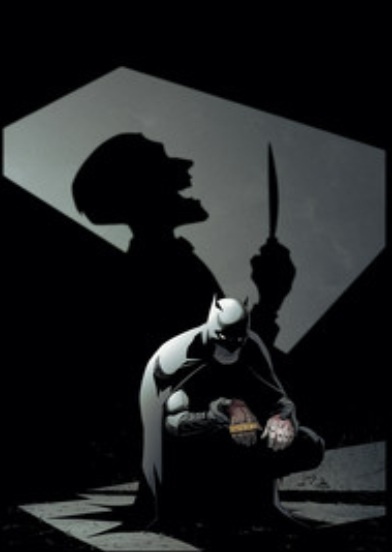 Batman issue 38 is part four in the Endgame story arc. It begins with Batman going to find Jim Gordon. The city is littered with the people of Gotham tearing the city, and each other, apart. Greg Capullo demonstrates his extreme skill as an artist at this point by portraying every individual with an impressive, and unique, deranged face. Most followers of the Batman book are familiar with Greg Capullo's artwork and once again the artwork truly stands out in this issue. All of people in the background are just as creepy as The Joker comes across in this arc. The writing might be dry and a bit boring for some. If you haven't picked up any of the other issues, you might find it hard to follow the dialogue on the virus. The majority of this issue is devoted to Batman discussing the semantics of the virus and what it is doing to the population of Gotham. Batman shows his detective abilities here as he's trying to reason his way to find a way to help out the people of Gotham. What I enjoyed most in this issue was the discussion with Dr. Dekker about the origins of the virus and Dr. Dekker's tales of ancient Earth. The story takes on almost metaphysical level here with the mentions of the Lazarus pit and yet another Joker origin story. I'll keep this spoiler free, but it's worth checking out if you're a fan of The Clown Prince of Crime. Joker origin stories can usually be taken with a grain of salt. We've read plenty of them throughout the years. Five panels towards the end of the issue that left me puzzled, though not in a bad or frustrated way. Rather, I found myself wondering what direction this series will take from this point. My interest is definitely piqued for the next issue and I am eager to discover what Joker has planned. How far will Batman go to stop The Joker and will Gotham be able to survive this virus?